Over two years ago, Air France Flight 447 crashed midway through a flight from Sao Paulo, Brazil and Paris, France. It took weeks to find any trace of the Airbus A330 plane, and to this day, investigators are unable to determine with 100% certainty what caused the crash. • Flight 447 crashed in Tasil Point, which is sort of a no mans land between South America and Africa. It's the point at which a plane's air traffic control station switches between the two continents. Radio frequencies become harder to pick up, conditions can turn ugly fast, and if something goes wrong, you're a long way from anywhere familiar. It's home to a vast sprawl of underwater mountains, and it is where over 3,000 pieces of wreckage have been found. 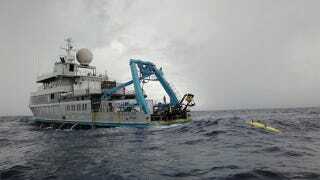 • Most recently, three autonomous Remus 6000 submarine units developed by the Woods Hole Oceanic Institute have been scouring the ocean floors of Tasil Point in search of clues. Searching the bottoms for 20 hours at a time, these units collect over 15,000 photos per run, while research teams pore over the data non-stop in 12 hour shifts. In their most recent run last month, these units uncovered new photos of wreckage on the ocean floor. For a passenger jet like the A330, the ideal cruising speed is about 560 miles per hour. If you go much faster, the center of lift moves back on the wing, pushing the nose down and increasing velocity, until you soon approach the speed of sound. At that point, shockwaves develop on the wings, interrupting the flow of air and reducing lift. The nose of the plane then gets forced into a dive that the pilot may not be able to pull out of. Then again, if you go too slow, the airplane stalls and falls. A plane must maintain a minimum speed to generate lift, and the higher it travels, the faster it must go. At 35,000 feet, the gap between too fast and too slow narrows ever closer. Pilots call it coffin corner. The author even recounts a tale of a plane crash once caused by an insect nest that built up in a Pitot probe, causing it to malfunction. Yikes. • The article points out that the black box is one of the most archaic, unchanged pieces of technology in all of commercial flight. Existing in its current form for over 50 years, many aerospace experts believe planes should stream data back to a central location via satellite. However, there might not be enough available satellite bandwidth to stream as much data as a plane would generate. One proposed solution is a button that would begin livestreaming data when a pilot suspected their plane was malfunctioning, which some believe could be implemented soon. • The official investigation is being conducted by the French Bureau of Inquiry and Analysis. Normal. Things get interesting however, when you add in the fact that France is also a key investor in both Air France and Airbus. The New York Times points out that this is common practice for many nations, but some still believe France is trying to sweep this mystery under the rug. • One interesting fact extracted from the autopsies of the crash victims is that there were no signs of burns on any bodies. Just fractures, bruising and blunt trauma. What does this mean? The plane probably didn't explode and likely hit the water in one piece. While unlikely, it's possible some could have survived the crash, and if they did, could have lasted as long as 12 hours in the 80 degree waters of Tasil Point. • After the crash, nobody arrived at Tasil Point until 11 hours after the plane disappeared. Protocol for a situation like this is to generate a virtual flight that takes different known factors into consideration such as weather. But after that, the traffic controllers spent a few hours casually confirming with other air traffic controller had spotted or contacted Flight 447. No one alerted a search and rescue team until 4 hours after the crash, and a boat wasn't sent out until 10 hours.